Science worksheets and activities to help kids learn about astronomy, biology, the environment, and more. 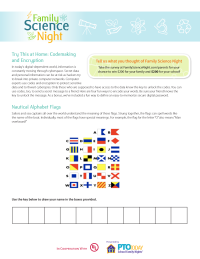 Help your kids practice science lessons with these fun science printables. Computer experts use codes and encryption to protect sensitive data and to thwart cyberspies. Only those who are supposed to have access to the data know the key to unlock the codes. You can use codes, too, to send a secret message to a friend. Here are four fun ways to encode your words. Be sure your friend knows the key to unlock the message. As a bonus, we’ve included a fun way to define an easy-to-memorize secure digital password. 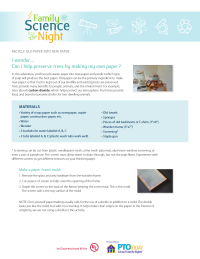 I wonder... Can I help preserve trees by making my own paper? In this adventure, you’ll recycle waste paper into new paper and predict which type of pulp will produce the best paper. Old paper can be the primary ingredient to make new paper so that trash is kept out of our landfills and existing trees are preserved. Trees provide many benefits to people, animals, and the environment. For example, trees absorb carbon dioxide, which helps protect our atmosphere. Fruit trees provide food, and branches provide shelter for tree-dwelling animals. I wonder... Why are bees so important to our environment? In this adventure, you’ll build a honeybee and try your hand at pollinating a flower. 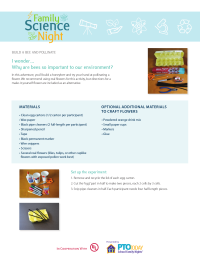 We recommend using real flowers for this activity, but directions for a make-it-yourself flower are included as an alternative. I wonder... Can I make a ball that bounces from common household ingredients? 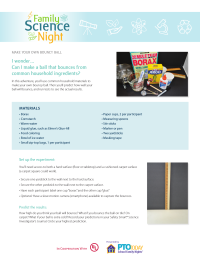 In this adventure, you’ll use common household materials to make your own bouncy ball. Then you’ll predict how well your ball will bounce, and run tests to see the actual results. 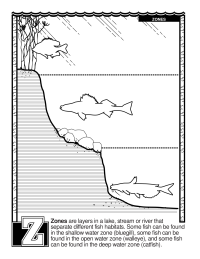 Read about zones, enjoy the coloring page, and learn the alphabet all with this printable coloring page created by the U.S. Fish and Wildlife Service.